This beautiful custom hallway storage bench is a fine piece of craftsmanship. Handmade to order using FSC certified wood and luxury Suede Vision upholstery fabric, it radiates elegance and brings a touch of class to your home. Multipurpose, it can store your blankets, throws or even shoes, whilst also doubling up as a decorative hallway bench seat. At 30 kg it is sturdy and strong. 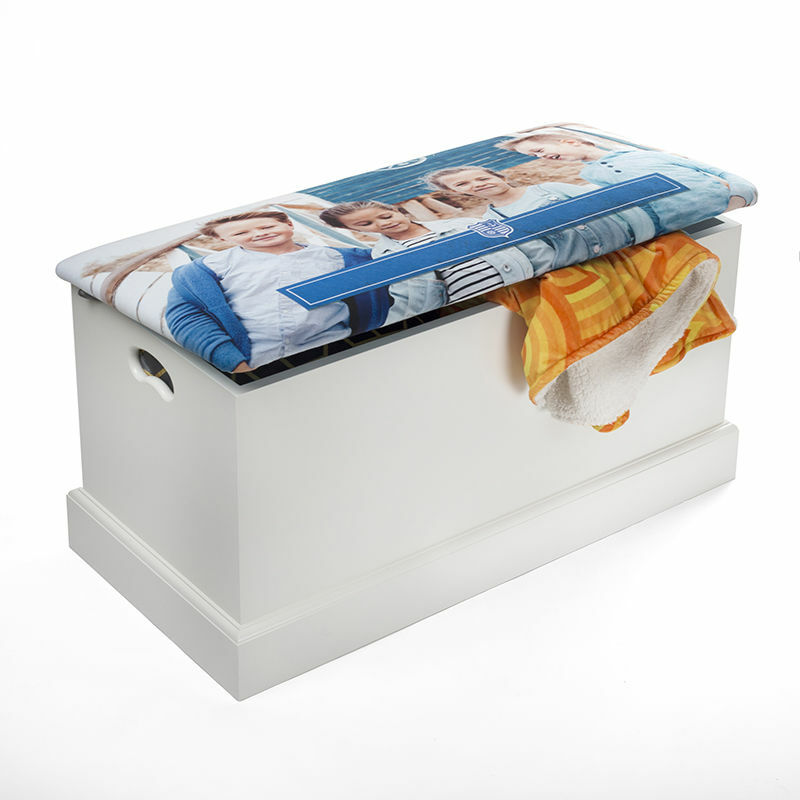 Print your pictures onto the soft close lid for a unique furnishing your family will love. For a premium home furnishing, design your own bespoke custom hallway storage bench that's a truly exquisite piece of craftsmanship. Hallways can easily get cluttered, from random shoes and jackets to umbrellas, bags and letters. This ottoman seat is the perfect furnishing to complement your home, providing a neat and tidy storage solution and a decorative seat. Handmade using responsibly sourced wood and a sultry suede vision upholstery fabric, your unique designs really come to life and look stunning printed onto the outer and inner lid. Your multipurpose piece of furniture simply radiates elegance and class and features a soft-close safety hinge so it's perfectly safe in a domestic setting with little ones about. Two curved holes are cut out into the sides for the handles, enabling you to comfortably grip and move the storage bench with ease. A stunning piece of craftsmanship, your box features so many impeccable qualities and intricacies that result in a flawless piece of furniture for the home. The recycled wood is expertly cut and built by carpenters, which is spray painted with strong, tough white paint. Your designs are printed onto the suede feel fabric, using a specialist process that fuses the ink deep into the fibres. When applied to a thick foam pad, it becomes a gorgeously soft and bouncy cushioned seat. Two layers of fabric are hand stitched together and are wrapped around the seat lid for a flawless and seamless finish. As an extra decorative detail, silver press studs run along the stitching lines on the internal side of the lid. Care: We use a smooth, soft, mock suede fabric for the seat/lid that has water repellent properties. This makes for easy maintenance, so simply wipe clean with a damp cloth. We wrap the fabric for the outer part of the lid fully around the seat, so some of your design will actually be visible on the inside. In the design interface, a large bleed area is indicated, and any part of your design that falls in this red area will appear on the inside of the lid. Make sure to position your photos correctly, and if using any text as part of your design, keep it away from the edges to avoid disappointment. You can choose the same or a different image for inside and out, giving you total creative freedom. The nickel plated press studs run along the edges of the wrapped around outer fabric, providing a clear distinguished border around the internal design. Choose a pattern that complements your existing hallway decor and curate a synchronised aesthetic for the home. Whether your personal style is eclectic and contemporary or vintage and twee, your customised storage bench can perfectly capture this and bring it to life. If you have the desired storage purpose in mind, you can also come up with a cute poem or phrase to have printed onto the inner lid. "Home is Where the Heart Is, But this Chest is Where Your Coats Live!" is a funny, whimsical idea that gives your box more personality. The photo reproduction on suede vision is sublime, so print a favourite family photo, or a beloved picture from your wedding day and adorn your hallway ottoman with cherished memories. This is a piece of furniture that'll last a lifetime, and over time can become an heirloom that moves down generations. Custom footstools are a great way to add a modest splash of colour or personality to a room. This personalised decorative chair is ideal for any room in your home to bring a sense of custom style and sophistication.